Do you remember when you first turned your brand new computer on and how fast it worked? With GameSwift and a click of the mouse you can bring back this speed to your computer instantly. GameSwift quickly scans your computer for common problems and fixes them, it then makes several permanent changes to Windows so your computer feels like it is brand new once again. 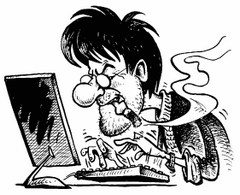 Don't deal with a slow computer and make tasks take longer to complete, install GameSwift and make your computer run faster. Over time as you install new and updated software, you get the impression your computer is slower due to these applications being more demanding of faster hardware. 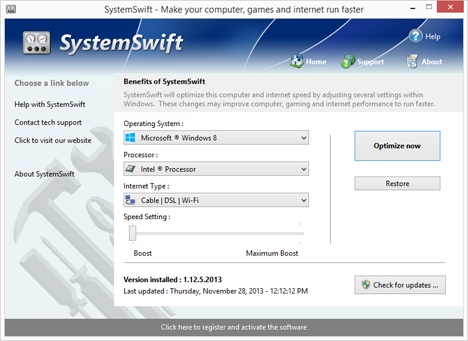 GameSwift makes your computer faster by making several changes to Windows settings; for instance it turns off several animations that degrade performance, instructs the CPU how to prioritize background tasks, how files are loaded and written to the hard drive and changes to the way memory is used when programs use the memory swap file. GameSwift repairs common problems found on most computers and instantly fixes them to improve computer stability and performance.